Electronic Kit School. - LiPo battery stand for Lithium Polymer battery is one of rechargeable battery that can provide high energy storage for weighting ratios in an eternal variety of sizes and shapes. This LiPo batteries has taken the electric RC gizmos world by storm,especially for Radio-Controlled (RC) toys like electric boats, helicopters and airplanes. Usually that LiPo battery cells are rated at 3.7 volts per cell and it's different with other rechargeable battery like NiCad (or NiMH) cells that have a voltage of 1.2 volts per cell. RC LiPo battery packs should have at least two or more LiPo cells hooked up in series to provide higher voltages in practice. So when this battery empty we can recharge again to fully the voltage of this battery. 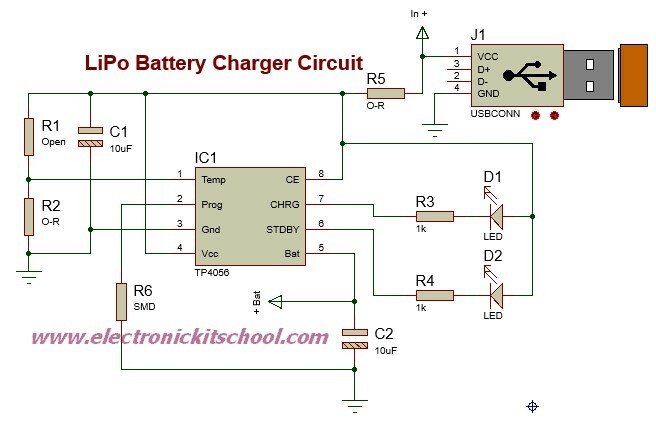 In this article we will give you one electronic circuit of LiPo Battery Charger Circuit for RC Toys using TP4056 IC like in Figure 1 below. The main component is used in this circuit is TP4056. Circuit like in Figure 1 above show you about the LiPo Battery Charger Circuit for RC Toys using TP4056 IC that give you one reference circuit to build by yourself of LiPo battery charger like for your RC toys based on TP4056 IC. From Electroschematics site that the TP4056 IC is a complete constant current/constant-voltage linear charger for single cell lithium-ion/Lithium Polymer (LiIon/LiPo) batteries. Its SOP-8 package and low external component count make the TP4056 ideally suited for portable applications. Furthermore, the TP4056 can work within USB and wall adapter. Other features include current monitor,under voltage lockout, automatic recharge, and two status pin to indicate charge termination and the presence of an input voltage. Feed USB power to the module input from any USB port, set the preset pot to zero Ohm (0R), connect a 3.7V LiPo battety at the module output, watch the onboard LEDs, and ascertain that everything is OK.
And now you can read more this article from original source using link of the name site above.